The Happy Blooms Basket brings together Asiatic lilies and carnations to create the perfect way to send your happy birthday wishes! Orange Asiatic lilies, lavender chrysanthemums, lavender carnations, purple monte casino asters, green button poms and lush greens are beautifully arranged within a rectangular whitewash willow handled basket accented with colorful curling ribbon. 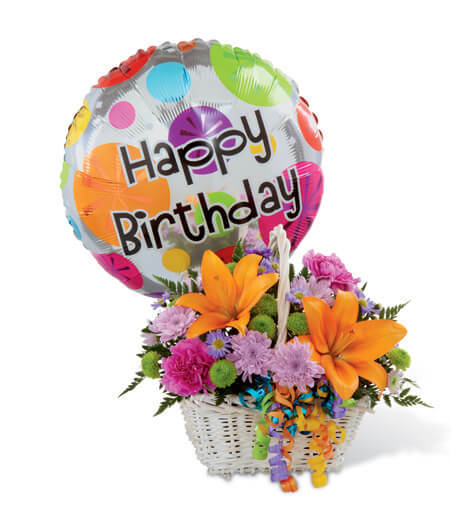 Arriving with a bright Mylar balloon exclaiming, "Happy Birthday," this flower arrangement will add to the celebration of their special day. GOOD basket includes 9 stems. Approx. 11"H x 12"W. BETTER basket includes 13 stems. Approx. 11"H x 15"W. BEST basket includes 18 stems. Approx. 12"H x 16"W.